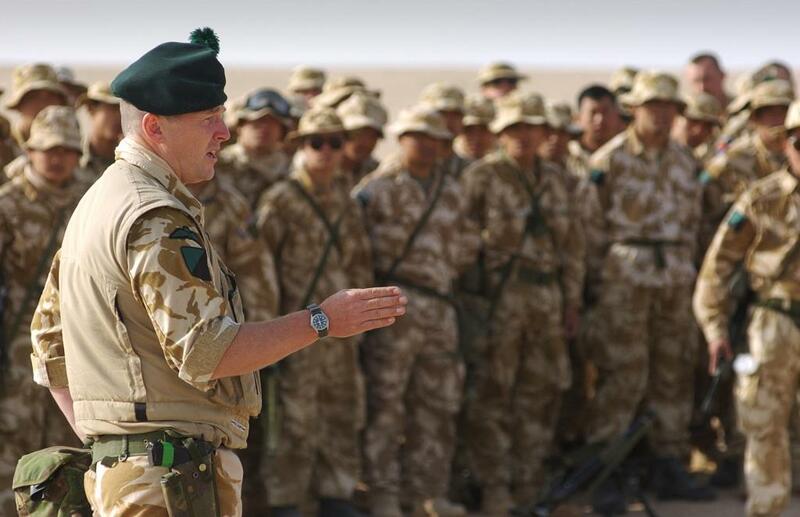 Lieutenant-Colonel Tim Collins addresses the Royal Irish Regiment. His speech in March 2003 has been described as one of history’s greatest military speeches. Within hours, the soldiers of the Royal Irish would set out into the unknown to fight a war of unpredictable proportions and unforeseen consequences. 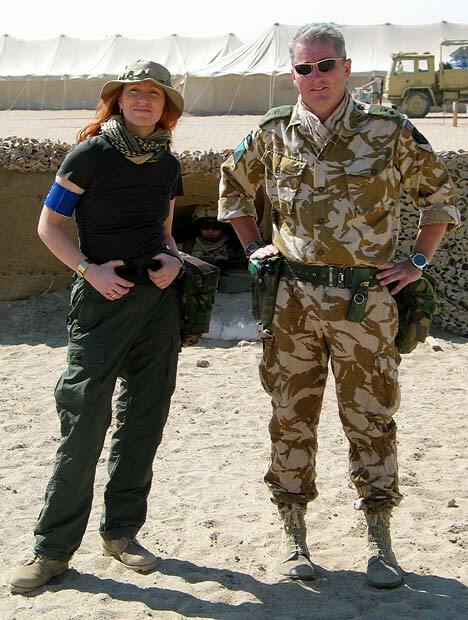 Journalist Sarah Oliver and Collins in Iraq. The colonel, she said, was naturally always at full volume. Especially, one would assume, when speaking to 1,000 soldiers without the aid of a microphone. “You will see things that no man could pay to see,” declared Collins. “And you will have to go a long way to find a more decent, generous and upright people than the Iraqis. You will be embarrassed by their hospitality even though they have nothing. “Don’t treat them as refugees, for they are in their own country. In his unprepared speech, Collins addressed the issue of death head-on. “If there are casualties of war, then remember that when they woke up and got dressed in the morning they did not plan to die this day,” he said. “Allow them dignity in death. Bury them properly and mark their graves. Collins addresses the Royal Irish Regiment on March 19, 2003. As for the enemy, he said many regional commanders with “stains on their souls” were stoking the fires of hell for their leader, Saddam Hussein. The Iraqi president would eventually be captured, tried and hanged by his fellow Iraqis. 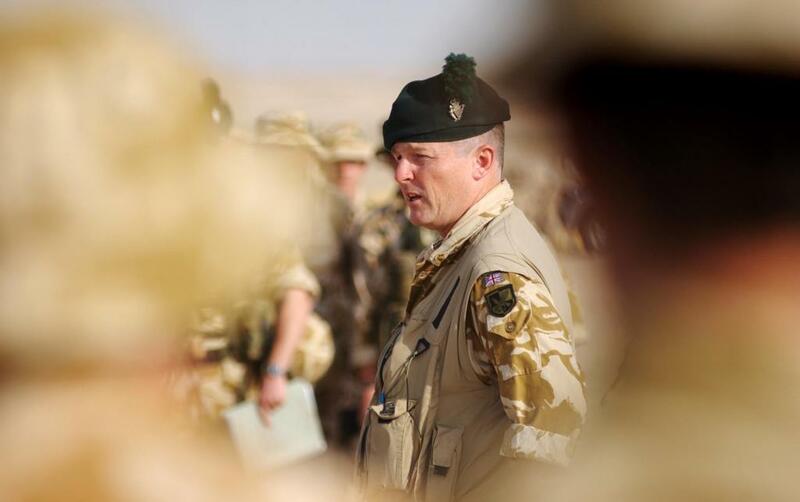 “He and his forces will be destroyed by this coalition for what they have done,” promised Collins. “As they die, they will know their deeds have brought them to this place. Show them no pity. But he reminded his troops to show mercy to those who surrender and not exceed the limits of good conduct in war. “If you harm the regiment or its history by over-enthusiasm in killing or in cowardice, know it is your family who will suffer. You will be shunned unless your conduct is of the highest—for your deeds will follow you down through history. “We will bring shame on neither our uniform or our nation. “Let’s bring everyone home and leave Iraq a better place for us having been there. Oliver described actor Kenneth Branaugh’s re-enactment of the speech for the BBC2 television series “Ten Days to War” as more reflective than the original. “The poetry does not soar as it did in the desert and it’s a lot less bossy,” she said. 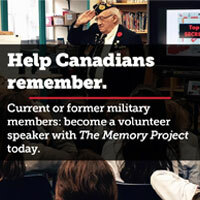 Canada did not formally participate in the Iraq War. Prime Minister Jean Chretien opted out—wisely, it turned out—citing the lack of a United Nations sanction. Kofi Annan, secretary general at the time, declared the invasion illegal, a breach of the UN charter. About 100 Canadian officers, on exchange to American units, were involved. Coalition troops and subsequent investigations by international teams of experts could find no evidence of the weapons of mass destruction that then-president George W. Bush claimed as the war’s primary justification. Hussein’s brutality, however, was well documented. He had his reasons. Without him, Iraq broke down into continuing sectarian violence and became a breeding ground for ISIS and other extremists. “Almost five years later, the words of Colonel Tim’s speech are still resonant,” Oliver wrote in 2008. “I think I know why. His historic and humanitarian idealism stood in bold contrast to months of political chicanery in Downing Street and Washington. Collins’ 1st battalion moved out the next morning and crossed into Iraq on March 22, 2003. The regimental website reports that his troops assumed responsibility for securing production facilities in the Rumaila oilfields. They also conducted counter-insurgency and humanitarian-assistance operations in the area, eventually expanding their zone of responsibility to more than 2,000 square kilometres—from the Kuwait border to the Hammer Canal. The Royal Irish eventually resumed their push north, occupying the town of Al-Midaina and securing crossings over the Euphrates River. Their advance took them to Al-Qurnah —the fabled Garden of Eden—before continuing their push to Amarah, where they patrolled extensively. Collins would bring them all home, returning to Canterbury, England, in mid-May. The battalion received a unit citation for its work. Collins was appointed an Officer of the Order of the British Empire for distinguished service. He retired a full colonel the following year. McDonald was on his final leave before ending his military career when he and Canadian Andrew Bradsell, 34, were killed in an ambush in Mosul. The two were working for a private security firm at the time.